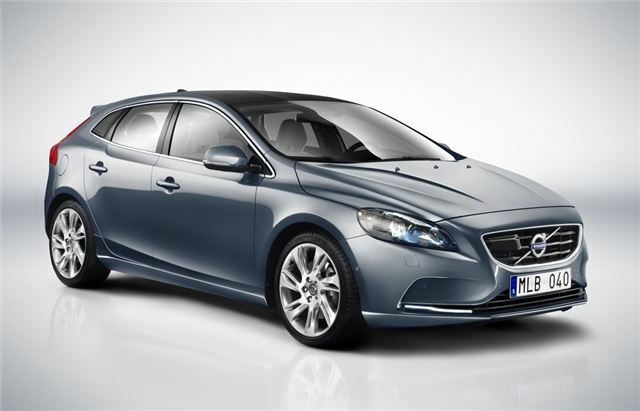 Volvo has revealed that its new V40 will be priced from £19,745 when it officially goes on sale. The five-door hatchback is available to order now with the first cars due to arrive in September. Describing it as a 'premium hatchback' the V40 is priced to compete alongside the BMW 1 Series and the new Audi A3. While the Volvo badge may not carry as much sway as the German brands, Volvo is hoping that the unusual styling of the V40 and high levels of standard equipment will attract buyers. The V40 is the first car in the world to have a pedestrian airbag, which helps reduce the severity of injuries to pedestrians in the event of a collision. It also gets the Volvo 'City Safety' system as standard, designed to prevent low speed accidents at up to 22mph. The cleanest version is the D2 diesel which emits just 94g/km meaning zero annual VED along with claimed average fuel economy of 78.5mpg. Powered by a 1.6-litre diesel engine with 115PS and 285Nm of torque it is fitted with a six-speed manual gearbox plus an engine start/stop system. There are three trim levels - ES, SE and SE Lux with all models getting Bluetooth, electric windows, a 5-inch colour display screen, climate control, 16-inch alloy wheels, a leather steering wheel and gear lever plus dynamic stability and traction control. Nav models come with a voice activated sat nav system with a 7-inch display screen and DVD player. As well as full European mapping, two complimentary annual map updates are also included. Company car users will benefit from strong Benefit In Kind figures, with the V40 D2 at £43 and £85 for 20 per cent and 40 per cent tax payers respectively.